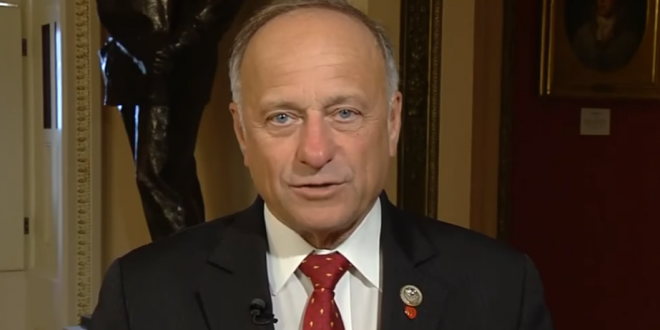 GOP Rep. Steve King Goes Full White Supremacist In Interview With Austrian Neo-Fascist Propaganda Site - Joe.My.God. Rep. Steve King (R-Iowa) visited Austria in August and gave an extensive interview to a far-right publication there in which he spelled out, in clearer and more shocking terms than he ever has before, his white nationalist worldview. “If we don’t defend Western civilization, then we will become subjugated by the people who are the enemies of faith, the enemies of justice,” King said. The interview is remarkable, capturing a sitting U.S. congressman completely fluent in modern white nationalist talking points just weeks before an election he is favored to win. At the link, you’ll see King expound on the so-called “Great Replacement” – a well-known fascist talking point which posits that immigration by non-whites is part of a deliberate campaign to “extinguish” white Western identity. King calls it “slow-motion cultural suicide.” Oh, and George Soros is totally paying for it. Earlier this week King endorsed Toronto mayoral candidate Faith Goldy, an open white nationalist who has appeared on the podcast for the Nazi site, The Daily Stormer. King currently has a ten-point lead over Democrat J.D. Scholten, but Scholten has outraised him by 4-1 in the quarter that just ended. Steve, I’m calling your bluff.